It's a scary feeling knowing you've swallowed a tooth. 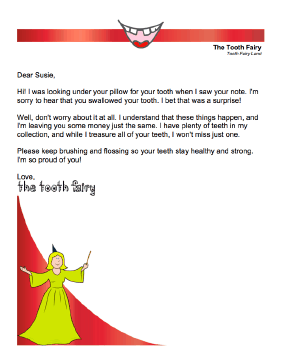 Perhaps worse is the fear that the Tooth Fairy won't come through with the usual money. This printable letter makes it clear that it's OK.
Hi! I was looking under your pillow for your tooth when I saw your note. I'm sorry to hear that you swallowed your tooth. I bet that was a surprise! Well, don't worry about it at all. I understand that these things happen, and I'm leaving you some money just the same. I have plenty of teeth in my collection, and while I treasure all of your teeth, I won't miss just one. Please keep brushing and flossing so your teeth stay healthy and strong. I'm so proud of you!